Most importantly is that students have a strong, supported air stream. Make sure they have developed an efficient aperture that generates some air pressure behind the lips. If the aperture is too open, the lips too loose, the player won’t be able to generate a strong sound. Be sure your students have these skills in place before teaching them to play vibrato and you will find they learn it very easily. Otherwise it can be a bit like the old metaphor of putting lipstick on a pig. And you can even harm their playing because students can easily get into pinching their embouchure and/or closing their throat in order to try to create the vibrato without sufficient air speed. Here’s how the exercise works. Measures 1-12 are the outline. Measures 13-16 show pulsing in eighth notes to be continued through the entire outline of m. 1-12, m. 17-20 show pulsing in triplets, m. 21-24 sixteenth notes and m. 25-28 quintuplets. You could carry this out to sextuplets and septuplets if you like. Here is a short video of me demonstrating the different speeds. Finally, a huge caveat about this exercise and using vibrato in general. This is an exercise to learn how to generate vibrato and learn to control the speed. 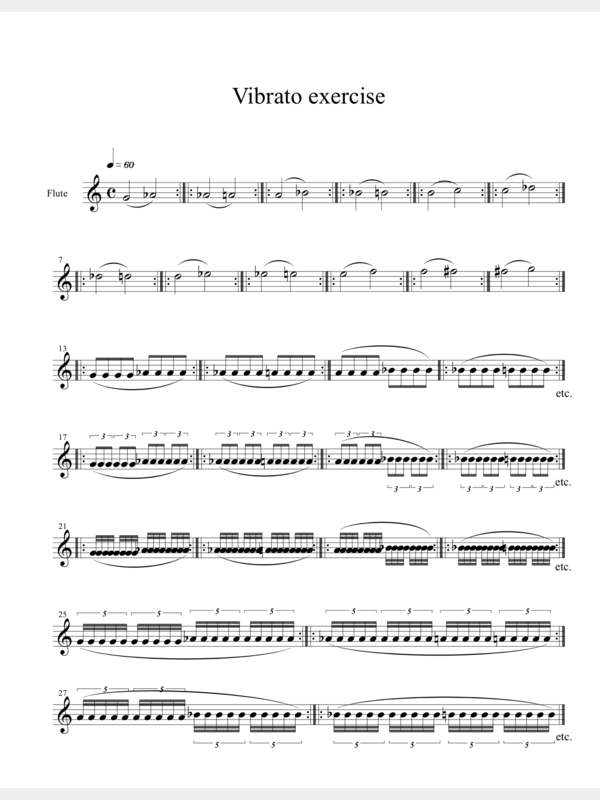 You will find that if you have your flute students practice this exercise daily either on their own or in a group class for one to two months, all your students will naturally start to add vibrato to their playing. Once the students start using vibrato as a matter of course, drop this exercise. What this exercise absolutely is not is a model of how to use vibrato for expressive purposes. For instance, I would never think of playing a long note and putting in seven pulses per beat. It is much too mechanical to apply vibrato in this way. I’ll explore vibrato types and expression in another post. If you find these entries helpful, please subscribe, share with your colleagues and come back next week for another flute tip. Please comment and feel free to ask me questions. Maybe the answer to your question will be the next flute tip. Find me on Facebook or email me at dr_cate@sbcglobal.net. For information about clinics and workshops click here.